The HR Diagram is linked to The Natures of the Stars and to Spectra. Return to STARS. The stellar astronomer's greatest tool is the HR diagram and its variants. The classical HR diagram, first constructed in 1914 by Henry Norris Russell (to which was added the work of Ejnar Hertzsprung), is a plot of absolute visual magnitude against spectral class. The natures of nearly all the myriad kinds of stars are beautifully expressed within its confines. With the application of theory, the HR diagram tells us how stars age and how one kind transforms itself into another. This page is divided into two sections. The first presents a modern classical HR diagram and its description. In the second, the HR diagram is overlaid with the locations of variable stars whose natures are summarized in the table that follows. From The Cambridge Encyclopedia of Stars, J. B. Kaler, Cambridge University Press, 2006. Copyright © Cambridge University Press. In this classical HR diagram, a wide sample of well-known stars is graphed according to absolute visual magnitude on the vertical axis and spectral class OBAFGKMLT on the horizontal axis. Each star is identified by name, or an abbreviation thereof. Most of the brighter ones have descriptive essays in STARS. Each magnitude division represents a factor of 2.5 in brightness. At absolute magnitude -10, stars are visually about a million times more luminous than the Sun, whereas at +20 they are about a million times fainter. The first seven letters of the spectral sequence belong to the original Harvard Sequence of 1901. Cool, red (and infrared) L and T were added in 1999. The sequence is a temperature scale that runs from about 45,000 Kelvin among the hot O stars at the left end to below 1200 K among the class T stars at the right end. Class T stars cannot be plotted since they are so cool that they can be observed only in the red infrared portions of the spectrum, and therefore have no visual magnitudes. 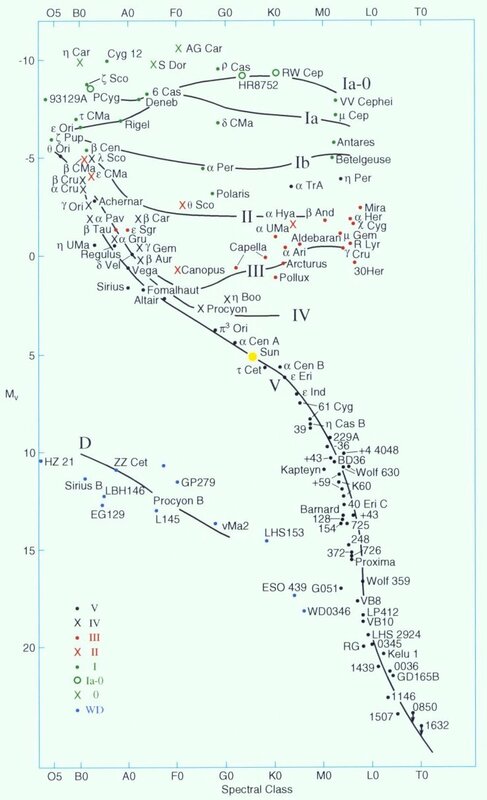 The mean positions of the different MKK (Morgan-Keenan-Kellman) luminosity classes, hence evolutionary states, are shown by solid lines labelled by Roman numerals (to which are added a class "0" for hypergiants and "D" for white dwarfs). The locus of the true hypergiants (class 0, "zero") runs across the very top. That of the low-metal subdwarfs (not shown) runs just to the left of the standard dwarf sequence from about class G on down. Half the stars of class L and all those of class T are brown dwarfs. The luminosity class of each star is coded according to the symbols in the legend in the diagram at far lower left (where "WD" refers to "white dwarf"). Variations on the HR Diagram theme include plots of true luminosity in watts vs. temperature, and various kinds of magnitudes plotted against color. Main sequence dwarfs from mid-L or so up through class O all quietly fuse hydrogen into helium in their cores. The highest masses, around 120 times that of the Sun, are at the upper left, while the lowest masses are at lower right. Class L and T brown dwarfs, with masses under about 0.075 times that of the Sun, are too cool inside to run full fusion starting with ordinary hydrogen, and can fuse only their natural deuterium (heavy hydrogen). When the core hydrogen runs out, main sequence stars balloon outward to become (depending on their masses) giants or supergiants. The lower a star's birth mass, the longer it will live. At the high mass end, hydrogen-fusing lifetimes are as short as two million years. At a mass of around 0.08 solar masses, lifetimes hit the 12-13 billion year age of the Galaxy. No star below this limit has ever died. Stars below about 10 solar masses expand and cool to become first subgiants and then true giants that fuse their core helium into carbon and oxygen (the cores surrounded by hydrogen-fusing shells). The coolest giants at far right have used all their central helium and are expanding again with dead carbon-oxygen cores (surrounded by nested shells that fuse helium and hydrogen and that alternate in their burning cycles). The advanced giants then lose their quiet outer envelopes through powerful winds to expose their cores, which become white dwarfs. The cooling time for white dwarfs is so long that none has ever disappeared from view in the history of the Galaxy. There are no "black dwarfs." When high mass dwarfs, those above about 10 solar masses, deplete their hydrogen cores, they expand and cool as supergiants. White dwarfs must be under 1.4 solar masses (the Chandrasekhar Limit) to support themselves; otherwise they collapse. A supergiant is so massive that its core would exceed the Limit. Moreover, its high mass allows its carbon and oxygen to fuse to heavier elements and then to iron. The catastrophic collapse of the iron core causes the rest of the star to explode as a brilliant supernova that typically hits absolute magnitude -17. Central stars of planetary nebulae. Planetary nebulae are complex shells of illuminated gas that surround dying stars. The shells are the compressed, expanding remnants of advanced giant star winds, while the central stars are in the process of becoming white dwarfs. They fall to the left of the upper-left quadrant of the above HR diagram. Neutron stars. Neutron stars (exemplified by X Persei) are the collapsed cores of supergiants that have exploded as supernovae. They are about 20 kilometers across with average densities of a million tons per cubic centimeter. With temperatures of the order of a million degrees Kelvin, they would fall far off to the left of the diagram. Black holes. Black holes, which may be created out of supernovae from the most massive stars, emit no light on their own and cannot be seen. Their surroundings may become visible if they accrete mass from a binary companion, but they still cannot be placed on an HR diagram. The best known is in the Cygnus X-1 system. The components of widely-spaced double (or multiple) stars evolve in the same way. However, if the members are close together, they can transfer matter back and forth (through tides) and strongly influence each others' development (the classic example Algol, Beta Persei). Transfer of enough mass from a normal star onto a white dwarf companion can cause the latter to exceed the Chandrasekhar Limit of 1.4 solar masses and to explode as another kind of supernova. These "Type Ia" supernovae (the core collapse kind called "Type II") can hit absolute magnitude -19 and are invaluable to the study of the distances of galaxies and of the expanding Universe. 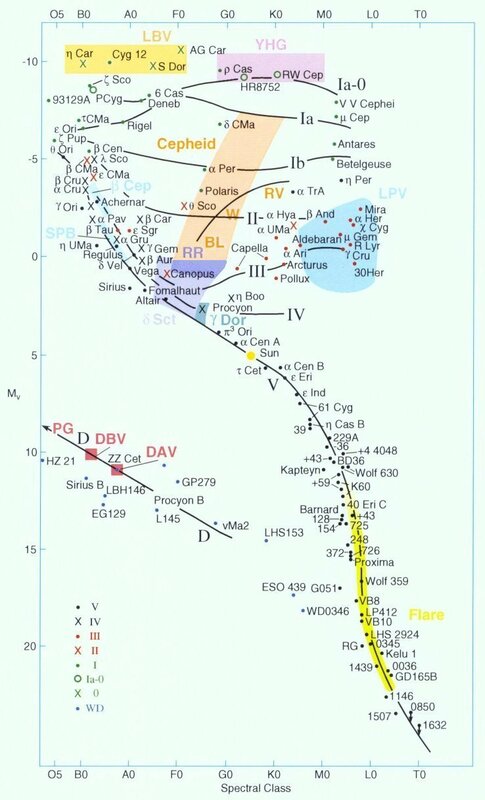 While most of the main sequence is stable, many other regions of the HR diagram (including a section of the main sequence itself) are not. As a result, stars can vary in brightness in a remarkable variety of ways, some pulsating, others erupting or flaring. Variables give great insight into processes that take place within stars. Different kinds of variable stars are denoted by labelled colored patches, which are named and described in the following list, going more or less from high luminosity to low. LBV: Luminous Blue Variables. LBVs exhibit three to four magnitude variations over periods of years, even decades, and are subject to huge eruptive outbursts. Such stars, like Eta Carinae and P Cygni, are very rare. YHG: Yellow Hypergiants, semi-regular variables subject to huge dips as a result of dusty outbursts. They are related to LBVs. A classic example is Rho Cas. Classical Cepheids (orange-yellow band) include Delta Cephei, Zeta Gem, and Eta Aql. Their absolute visual magnitudes are closely tied to their pulsation periods, allowing them to serve as prime distance indicators. BL, W, RV: Respectively BL Herculis, W Virginis, RV Tauri stars. Sometimes called "Population II Cepheids," they are lower metal, lower mass versions of classical Cepheids with respectively short, intermediate, and longer periods that range to 100 days. RR: RR Lyrae stars, low mass pulsating stars with helium-fusing cores. They have variation amplitudes of a few tenths of a magnitude and periods under a day. Their uniform absolute magnitudes make them good distance indicators. Delta Sct: Delta Scuti stars, class A dwarfs, subgiants, giants, with variations of a few hundredths to tenths of a magnitude and multiple periods under a day. Gamma Dor: Gamma Doradus stars, class F versions of the above, but with longer periods and a somewhat different pulsation mechanism. Beta Cep: Beta Cephei Stars. Class B giants and subgiants that vary by a few percent with multiple periods usually under a day. SPB: Slowly Pulsating B stars, also known as 53 Persei stars. SPBs are lower luminosity/temperature versions of the above. LPV: Long Period Variables, otherwise known as Mira variables. These remarkable stars have five to ten magnitude variations over periods of 100-600 days. All are brightening red giants with dead carbon-oxygen cores. Stars with shorter periods and lower amplitudes are generally referred to as "semi-regular variables." Some are also classed as carbon stars. DAV: White dwarf variables with pure hydrogen outer layers. Also called ZZ Ceti stars, they lie on the extended instability strip and vary by a few tenths of a magnitude over periods of minutes. Temperatures range from 10,500 to 13,000 Kelvin. DB: White dwarf variables with pure helium outer layers. They are higher temperature (20,000 Kelvin) versions of the above. PG: PG 1159 stars. Very hot (130,000 Kelvin) versions of above two. They are related to the central stars of planetary nebulae. Flare: Flare stars. These are mostly class M red dwarfs, though K and L dwarfs can flare too. They exhibit sudden brightening across the spectrum as a result of reconnection/collapse of magnetic fields similar to (but more violent than) those that take place on the Sun. The best known is Proxima Centauri. Except as otherwise noted, copyright © James B. Kaler. All rights reserved. These contents are the property of the author and may not be reproduced in whole or in part without the author's express consent except in fair use for educational purposes. HR diagrams copyright © Cambridge University Press. Any reuse must request permission from the Press. Thanks to reader number .